Usually by the time I write these commentaries I’ve poured all my flailing fangirl energy into tweets and can focus on that High Quality Analysis you crave, but this week…yeah, this week requires some in-post flailing, too, because Rakugo Shinju melted me into a puddle of feels repeatedly, and two days later I’m still in the process of reforming into a solid human-shaped blogger again. So, to begin: HOW GREAT IS LI’L SHIN, YOU GUYS? 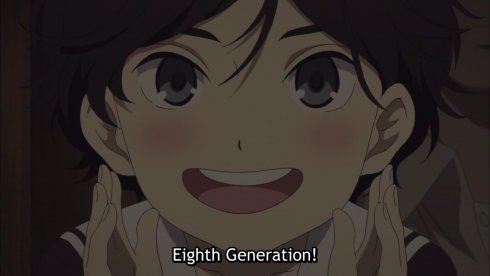 How cute is it to see Yotaro and Konatsu lose their minds over his rakugo talents? How sweet is it to watch Shin slide right past Yakumo’s grumpy defenses at every opportunity, and how heartwarming that Yakumo’s responds with his own awkward affection? I died a little when Shin called him grandpa, and then I died a lot when Yakumo hugged him, and then I even died a little more when Shin spoke up in Higuchi’s defense and Yakumo totally caved at his “grandson’s” behest. 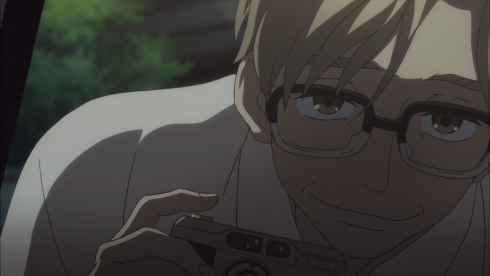 And then of course HOW PERFECT WAS KONATSU, I MEAN SERIOUSLY? 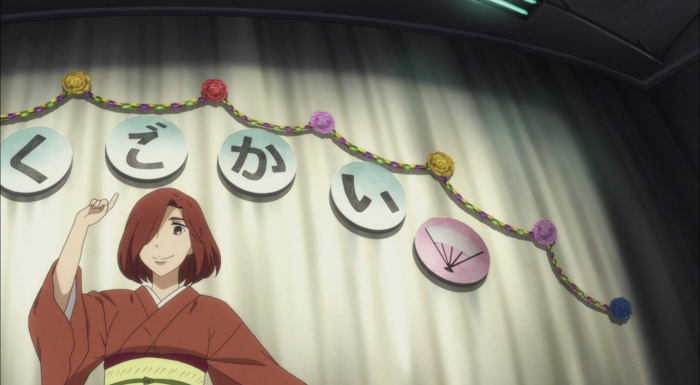 How satisfying was it to see her not only find a place within the rakugo world backstage, but then to finally, FINALLY perform in front of an audience? How vibrant and joyful was that performance? How happy did Konatsu look to be in front of those lights, that laughter, the applause? And how adorable was Yotaro, so enthusiastic and supportive, encouraging her to do something she’s always wanted to do but never felt like she could? After DECADES of isolation and grief and loneliness, Yakumo and Konatsu at last have people who will show them love without reservations. And I. I just. Cannot. Find the words. For how happy that makes me. No words. This. Episode. Was. Too. Good. …Ah-hem. H’okay. Now that I’ve gotten that out of my system, let’s spend some time talking about why and how this all comes together so well! 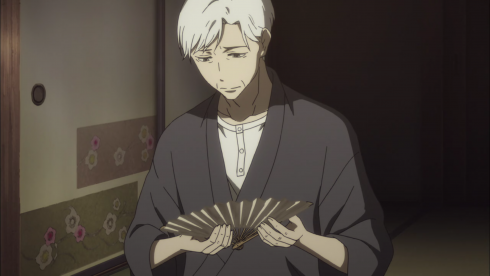 Our rakugo piece, “Jugemu,” is at the heart of every scene, and it also ties in to pretty much every plot, theme, or character development. The narrative itself uses “Jugemu” as a kind of commentary on context: When Shin opens the episode singing a string of seeming nonsense, or when Higuchi talks about how “Jugemu” ends, we at home have no idea what this is about. It doesn’t become clear or significant until Konatsu performs the entire piece much later in the episode. Similarly, this week’s character beats only resonate because of the struggles we’ve seen before. The same may be true of a lot of classic rakugo as well; we can’t expect the audience to enjoy it if they don’t know the culture/history surrounding it. It’s a smart storytelling tactic that builds curiosity and anticipation (because we all know someone is going to perform “Jugemu” eventually, now that we’ve talked about it so much), and certainly “Jugemu”‘s central ideas about “the charm of a child” and the problems that arise from indecisiveness and fear (i.e., using all the names rather than choosing one because you’re afraid you’ll regret your choice) speak to Shin’s role as well as our adult cast’s constant grappling with past regrets and future risks. But I’d say the real importance of “Jugemu” (and possibly this entire series) isn’t the story itself, but the history behind it. As Higuchi tells Yakumo, the ending of “Jugemu” has changed over time from a grim one where the child drowns to a much lighter one about kids getting into a fight. Even these supposedly timeless classics have been altered, bit by bit, because a performer risked doing something new and the audience approved of it. That promise of change has been embedded in our narrative for a long time, through our focus on generations and inheritance, but it’s only recently that we’ve seen that promise slowly being fulfilled. If our first season was about a found family falling apart, then our second season is (so far) about a found family coming together. Fear and jealousy were always simmering just beneath the surface last season, which eventually severed the relationship between the previous master, Kikuhiko, and Sukeroku. 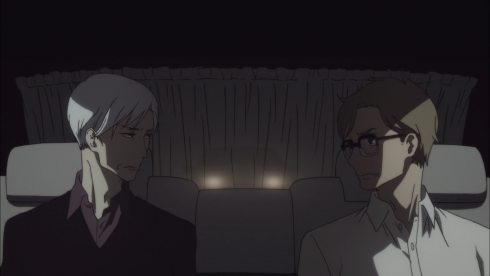 Much of this came from the old master’s refusal to let rakugo evolve, but it also came from Kikuhiko and Sukeroku’s rivalry and their failure to communicate with each other. Yakumo and Konatsu, thoroughly embedded in the unchanging rakugo bubble I mentioned a couple weeks back, stagnated in those same feelings, internalizing not only the guilt and anger that’s plagued their relationship for decades but also the traditional ideas about what rakugo “should” be: A man’s world where people recite the same pieces over and over again. No new stories allowed. No women or children allowed, either. Into that world come three relative outsiders: Yotaro, who wasn’t raised within rakugo society and so feels less beholden to its traditions; Higuchi, an academic more interested in preserving the form than the letter; and Shin, a whole new generation with no ties to rakugo tradition or the painful pasts that linger behind all of our characters. They bring with them new outlooks and an unwillingness to shrug their shoulders and say “that’s just the way things are.” Even better, they’re openly affectionate and supportive, something we’ve yet to really see in the Yurakutei line. Yotaro doesn’t care that women aren’t supposed to perform rakugo; Konatsu loves it and she’s good at it, so she should do it. 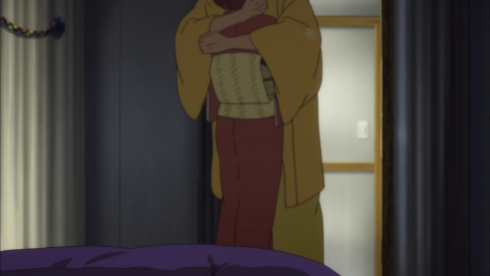 Shin doesn’t know about his “grandpa’s” (brb dying again) long-buried trauma or history with his biological grandparents; he loves him and his rakugo and feels safe with him. 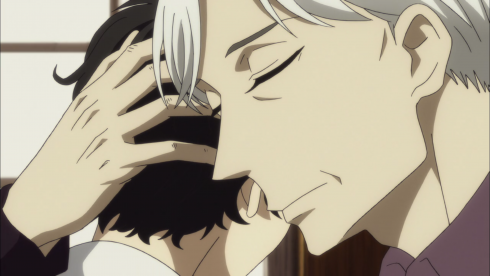 And Higuchi doesn’t give a damn if Yakumo wants to fade into oblivion and take his rakugo with him; he’s going to preserve this unique art form and help it thrive going forward. In the same way “Jugemu” has quietly changed over the years, so too are our characters, and so too is the course of our narrative. We’ve still got a ways to go, but this really doesn’t feel like a tragedy anymore, and thank goodness for that. Yotaro and Konatsu have found a sense of happiness fairly quickly, which maybe isn’t surprising given that they’re younger and have the mutual support of one another (and Shin). 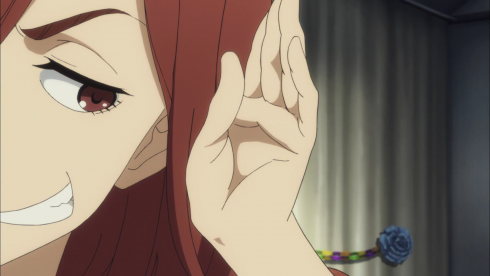 True, Konatsu is still clinging to the sexist notion that women don’t have a place on the rakugo stage, but the way she gives that little speech about rakugo’s “beauty” to a skeptical Yotaro sounds almost rehearsed, and the way she won’t meet his eyes suggests she’s not quite sure she believes it, either. I don’t think we’re supposed to agree with Konatsu here, which hopefully means her story hasn’t been put to bed just yet. If there are any elements that speak to future trouble in paradise, it’s Yakumo, our biggest enigma and Higuchi’s most stubborn opponent. 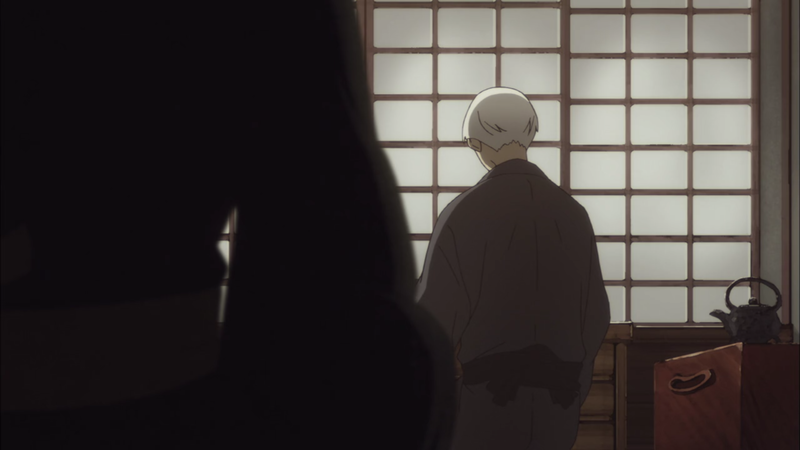 Despite his obvious affection for Shin (and Yotaro) (and yes, even Konatsu), he spends most of this episode being kind of a jerk, criticizing Konatsu and speaking out against changes within the rakugo world, something he’d been fairly quiet about up to this point. 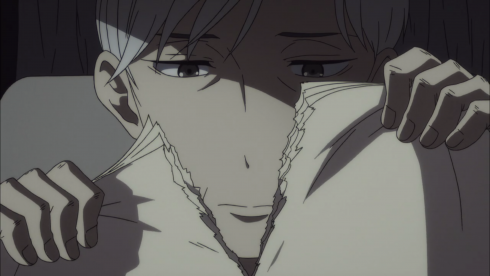 Given how long and how deeply he’s buried himself in guilt and grief, every scene with him reads like self-sabotage: Like he’s so convinced he doesn’t deserve happiness, that he and his rakugo don’t deserve to live, that he’s actively trying to alienate himself, antagonizing the people around him so they’ll give up on him the way he’s given up on himself. For all the joyful flailing this episode brought me, there’s still a shadow here, and it’s going to be a mighty difficult one to dispel. For the sake of my poor heart, I sure hope we do. 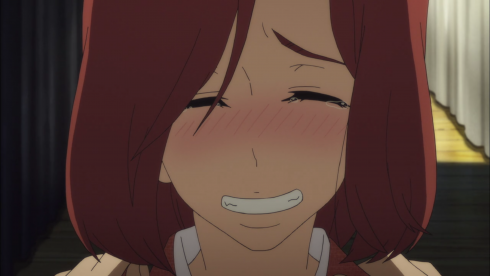 While I don’t think Konatsu has to become a professional rakugo-ka for her story to be a satisfying one, I will be genuinely disappointed if she doesn’t change her opinion about women in rakugo. We are getting into a time in history where female shun’ichi were an actual thing, after all! 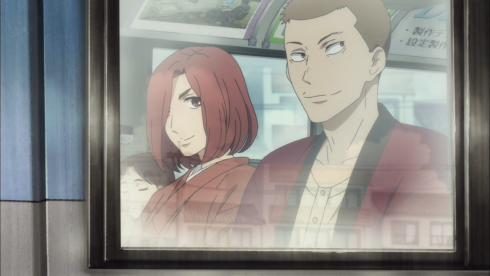 Vehicles were used quite nicely to visually depict relationships and characters this week: Konatsu and Yotaro on a sunlit bus, traveling side-by-side together; Higuchi hitching a ride with a reluctant Yakumo through darkness and intermittent streetlights; and Shin carried along asleep, blissfully unaware of the conflicts clashing around him. The Sensei Next Door: Yakumo begins his rakugo piece with the phrase”Benkei and Komachi were fools.” It’s a line from a poem about Ono no Komachi and Musashibou Benkei, two figures out of Japanese history/legend who were known for their lack of sexual relations (Komachi flirted but was too haughty to take a lover; Benkei had a wife but was too busy serving his lord). Bit of a sadly self-deprecating line, really, given that Yakumo himself is celibate, if not outright asexual. 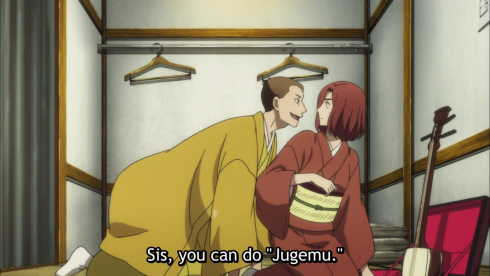 This Week in Rakugo: With the possible exception of “Jugemu” (I think we’ve heard that opening “charm of a child” monologue before, but don’t quote me on that), every piece this week was a repeat of one we heard in Season One. 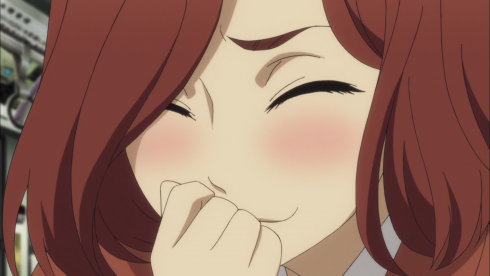 Sorta hammers the notion that rakugo is in need of new material, don’t it?